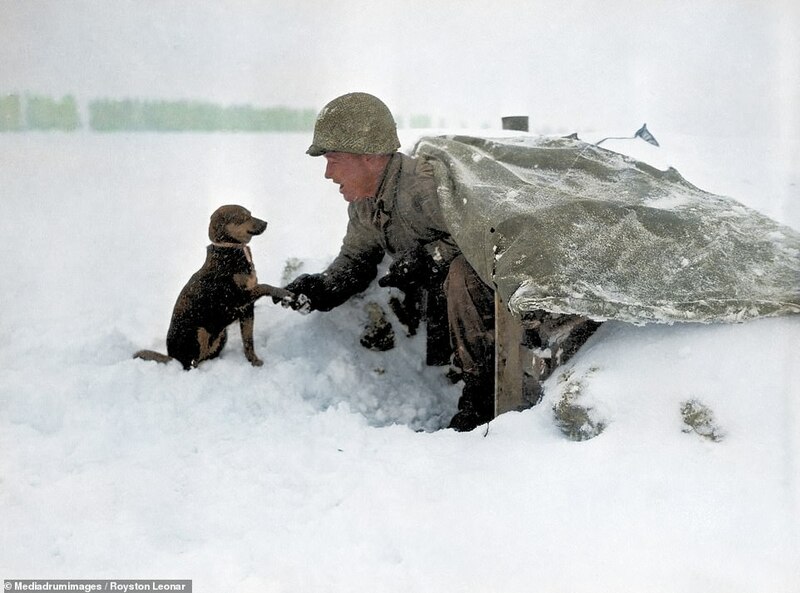 The terrible wintry conditions soldiers were forced to fight in during the last major German offensive of World War Two have been brought to light thanks to a series of colorised images to mark the 74th anniversary of the Battle of the Bulge. 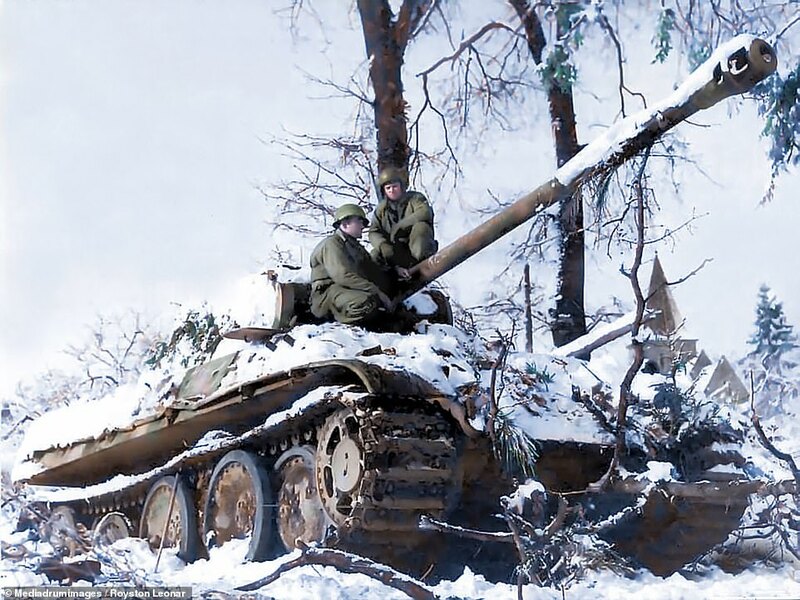 Striking pictures show three gunners prepare to fire a shell on New Year’s Eve in 1944 with the inscription ‘For Adolph, unhappy new year’, American GIs are pictured resting on railway tracks after combat in Düren and two soldiers can be seen inspecting a deserted Panther tank formerly of the Panzer Division Das Reich near Grandmenil, Belgium. 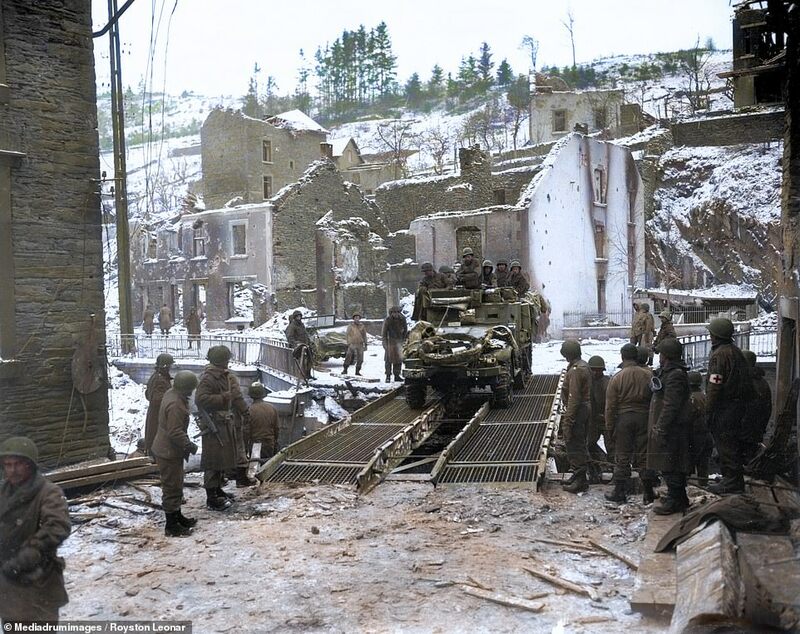 Other vivid colour photographs show a US half track cross a temporary bridge over the Ourthe River, members of the US 101st Airborne Division move out of Bastogne and Panzergrenadier-SS Kampfgruppe Hansen in action during clashes in Poteau against Task Force Myers. 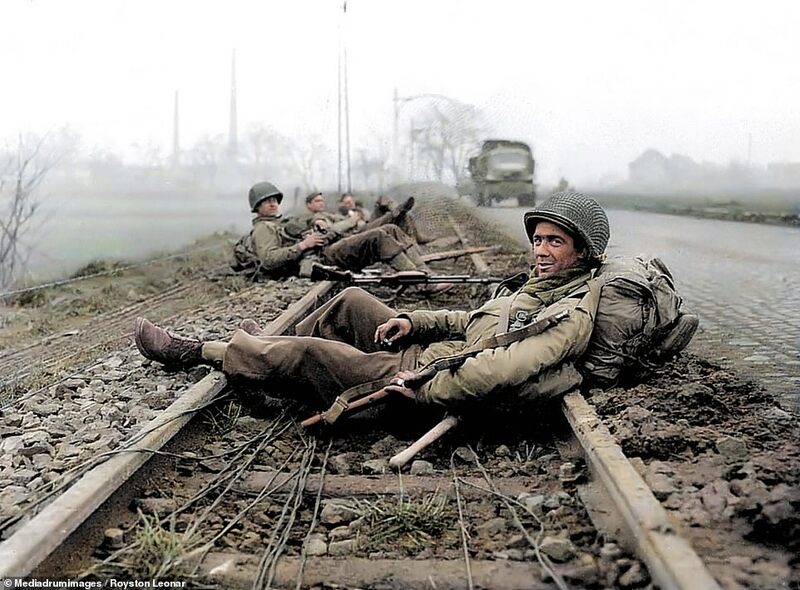 The original black and white photos were painstakingly colourised by Welsh electrician Royston Leonard ,55, from Cardiff, Wales, with each snap taking between four and five,hours to complete. 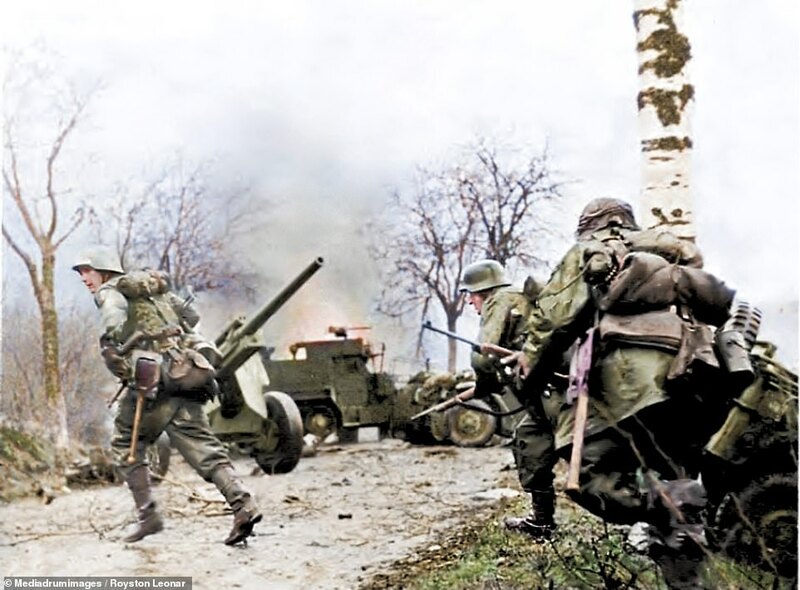 ‘As time goes by I find I am doing more World War Two pictures and giving them a bit of colour helps the younger generation to connect and not just see them as something that happened long ago,’ he said. ‘In the images I see a world that has gone mad and men and women pulled from their lives to sort out the mess. It was launched through the densely forested Ardennes region of Wallonia in eastern Belgium, northeast France, and Luxembourg, towards the end of World War II. 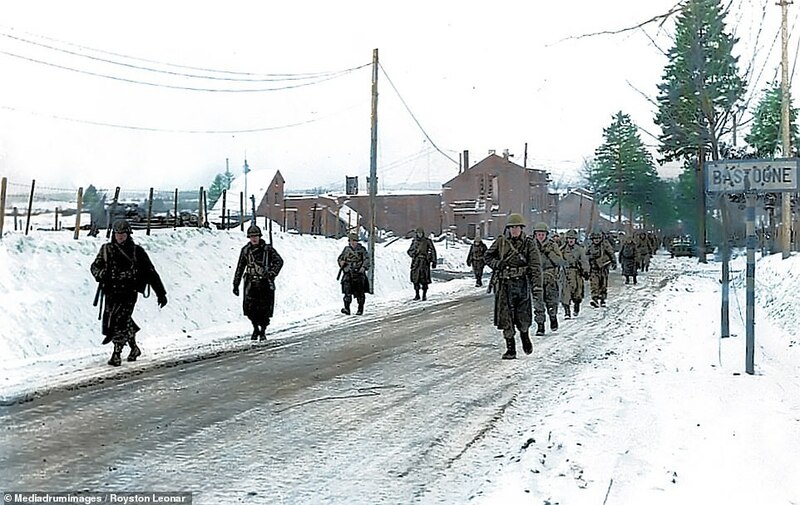 The furthest west the offensive reached was the village of Foy-Nôtre-Dame, south east of Dinant, being stopped by the British 21st Army Group on 24 December 1944. 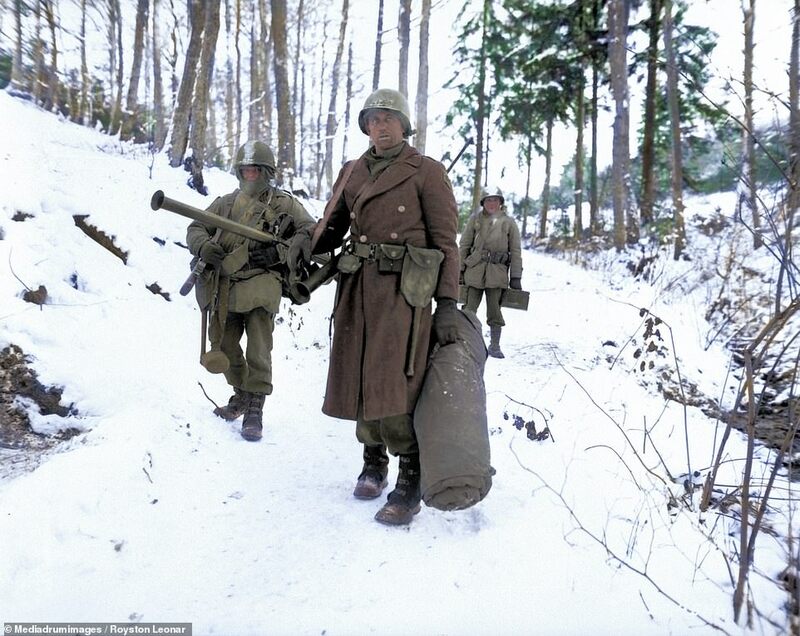 The German offensive was intended to stop Allied use of the Belgian port of Antwerp and to split the Allied lines, allowing the Germans to encircle and destroy four Allied armies and force the Western Allies to negotiate a peace treaty in the Axis powers’ favour. Once that was accomplished, the German dictator Adolf Hitler believed he could fully concentrate on the Soviets on the Eastern Front. The Third Reich was not as politically sound as people had originally thought. Physically they were prepared for this battle. The surprise attack caught the Allied forces completely off guard. 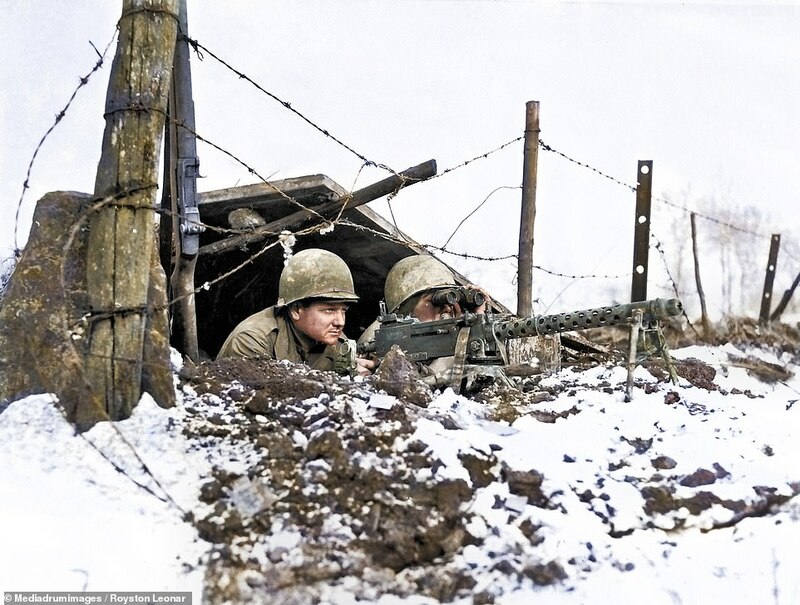 American forces bore the brunt of the attack and incurred their highest casualties of any operation during the war. 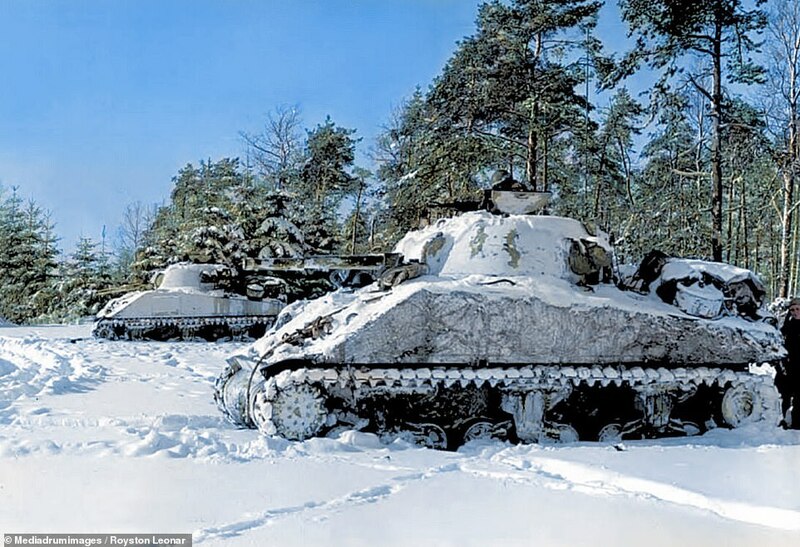 The battle also severely depleted Germany’s armoured forces, and they were largely unable to replace them. German personnel and, later, Luftwaffe aircraft (in the concluding stages of the engagement) also sustained heavy losses.